This light is best for projects requiring a lot of light. When your parts are moving fast, you need to light a large area, or you have a long working distance, this is the light to consider. 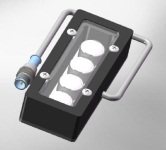 Part of the Monster series manufactured by Spectrum Illumination, this ultraviolet light is typically used in fluorescing applications. The UV light is projected onto a fluorescing material, such as certain papers, adhesives, and plastics. The UV causes the fluorescing material to emit light in the visible spectrum, which is then imaged by a camera. It is important to know which UV wavelength causes the most fluorescing with your material. Our 365 nm lights are necessary for many applications, but cost more and generally have a shorter life than our 395 nm lights. Please contact us if you’re interested in controller options, a longer cable, a high-flex cable, or a custom light size.